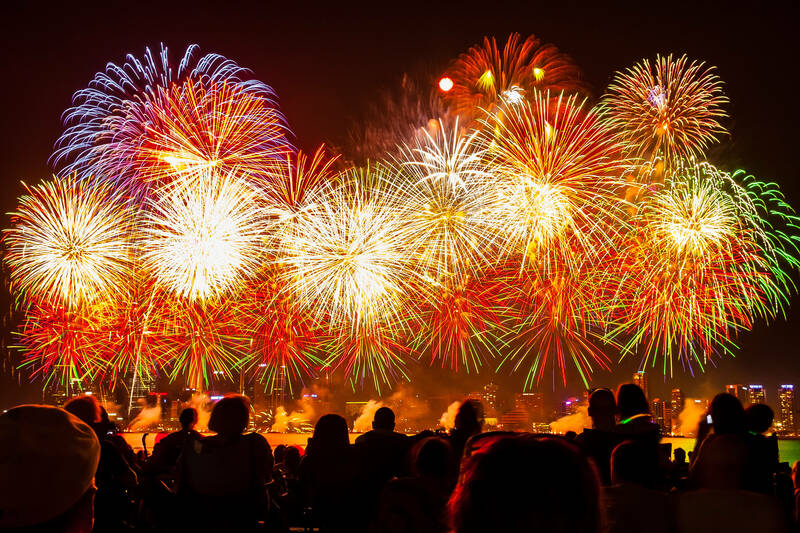 Australia Day fireworks in Perth, Western Australia. Image courtesy of Creative Commons Google Images. Smear your cheeks with red, white and blue paint. Crack open a Coopers Ale and line up a backyard cricket pitch. Flaunt your Southern Cross constellation tattoo under a sweltering summer sun. Yes, you can even chuck some shrimp on the proverbial “barbie”. Whatever you do to celebrate Australia Day, be sure of what you’re celebrating. Image courtesy of Creative Commons Goggle Images. January 26th commemorates the arrival of the First Fleet – ships carrying British settlers, soldiers and convicts – into Sydney harbor in 1788. While Aussies around the world will recognize the national holiday with outdoor festivities and that quintessential Down Under optimism, the event also has a fair crowd of protestors. Like Columbus Day in the United States, Australia Day has been challenged as a racist, inconsiderate reflection of imperial colonization that ignores the indigenous peoples who suffered after the arrival of – or ‘discovery’ by – Europeans. Our traditions define our national identity; so, before you tie a flag around your shoulders, here are six other thought-provoking ways to prepare. LEARN: As I’ve mentioned in recent posts, places have a way of changing history. Before you make an opinion about the political correctness of Australia Day, pick up the facts from an unbiased source, such as The Australia Day National Network. 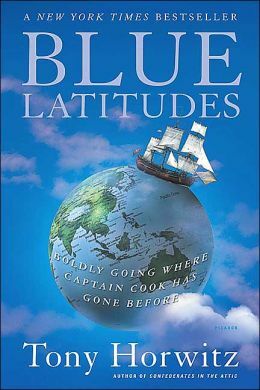 READ: Blue Latitudes: Boldly Going Where Captain Cook Has Gone Before, by Tony Horwitz. If the bold Englishman, Cook, had not landed on the world’s largest island in 1770, we might be partying for different reasons today. Latitudes cleverly combines historical analysis of Cook’s original ocean voyages with Horwitz’s own modern travels through the places Cook landed. Observations about Cook’s relatively humane treatment of indigenous peoples, and the twists in his current reputation, are especially relevant to Australia Day. WATCH: Rap News 1, with Ken Oathcarn. I’ll let you decide if Ken is being objectively critical of the national holiday, or simply deceptively self-deprecating. Well-written rap verse asks “What, exactly, are you celebrating?” The development of a great nation, or genocide and colonization? And is it possible to applaud a history that involves both? LISTEN: Triple J’s Hottest 100. Show your support for another side of Aussie culture: its flourishing music scene. Over 40% of the artists to earn credit for the 100 greatest songs of 2013 are Australian. The annual list, voted on entirely by listeners and broadcast live on Jan. 26th, has become a more recent addition to the yearly occasion. CONSIDER: Australian of the Year Awards. A handful of individuals are nominated and chosen as nation-wide role models, people who “make us proud to be Australian.” From singer-songwriters to athletes and educators, this year’s winners have been especially recognized as instigating change on Aboriginal rights issues. EAT: And finally, because the bbq is still a central point of the holiday, how about stretching your taste buds beyond grilled sausages and trying a few of the lesser-known dishes, like lammingtons, that you can only find in this Great Southern Land. 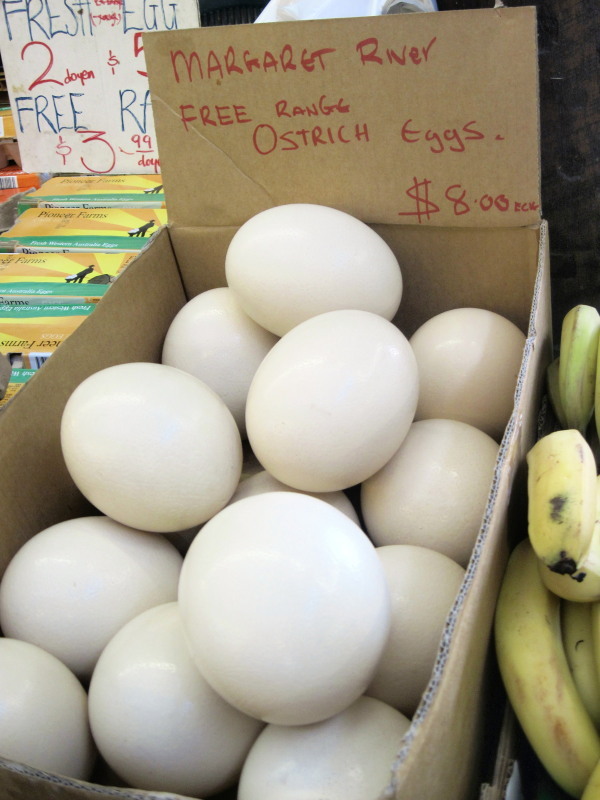 Ostrich eggs are one of the unusual food stuffs found at the Freemantle markets in Western Australia. After all, that’s where you’ll find me on Australia Day: applying sun cream in a city park, hoping to integrate the country’s unique beauty and contentious history with a lazy sky above me, and a wallaby burger in one hand.